SIL Converters for Word absent if Word not installed. SIL Converters version 2.6 is intended to be installed using the Master setup program found here. This document is intended to guide you through the Master Installer installation screens and initial SIL Encoding Converters2.6 Setup. This guide may be sufficient for many users. However, to make full use of SIL Encoding Converters 2.6, you should refer to the SIL Encoding Converters documentation. SIL Encoding Converters2.6 Setup—Conversion applications are installed and conversion Maps and Tables are copied to your hard drive. This section is intended as a guide for initial setup. For detailed information on the SIL Encoding Converters2.6 Setup see Help for SIL Converters 2.6. 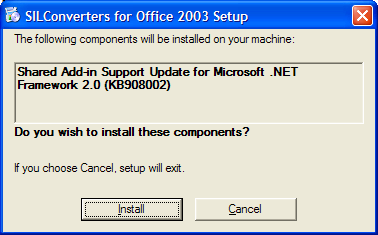 You do not need to know exactly what you want to install the first time you run the Setup program. You can run the Master Setup program again to add or delete components. For more information on the SIL Converters components and features see Help for SIL Converters 2.6. When you see the SIL Encoding Converters 2.6 has been successfully installed message, click Finish to continue. Since this 2.6.1 release is an intermediate release meant to fix some compatibility problems with FieldWorks and Speech Tools programs, the SIL Converters documentation was not updated for the 2.6.1 release. Therefore any references to version 2.6 in the documentation should be considered as applying to v 2.6.1. This applies especially to the Help for SIL Converters 2.6 and Help for SILConverters 2.6 Installation menu items in Start / All Programs / SIL Converters / Help documents. SILConverters 2.6.1 supports encoding conversions using Python Version 2.5. This means you must have a Python Version 2.5.x. installed on your computer. It will not work with an earlier or later Python version (e.g. 2.4.2 or 2.6.1). As of this writing, Python Version 2.5.1 is available for download from http://www.python.org. SIL Converters 2.6.1 supports encoding conversions using only Perl Version 5.8.8. It will not work with any other Perl version (e.g. 5.8.7). The Perl converter has been tested with the following freely available Perl distribution: ActiveState Perl. If you use SIL Encoding Converters 2.6 or earlier versions, the FieldWorks 5.0 installer will automatically uninstall SIL Encoding Converters. This is done to avoid compatibility problems. See the upgrade information which follows. Technical Details: Old and new versions can be installed and work together normally. However, if you then emun}install any of the programs, it will remove some core encoding converter registry settings that the remaining program(s) depend on. As a result, encoding converters within FW or SA will lose some functionality until the registry settings are restored. Typical error messages may state “Encoding Converter not found” or “Error initializing Document reader”. The problem can be fixed as follows: download or copy RegisterSEC.bat to your hard disk, then execute the batch file while logged in to an administrative user account. On Vista, you must run it by right-clicking the batch file, then selecting ‘Run as Administrator’. RegisterSEC.bat is found on each installation package in the FieldWorks, Speech Analyzer, or Encoding Converters directory. Alternatively, you can fix the problem by rerunning the appropriate installer and choosing the Repair option. For those that know how, you can also fix the problem by using regasm to register SilEncConverters22.dll in c:Program FilesCommon FilesSIL2.6.0.0 or 2.6.1.0. Non-administrative Vista users may discover that some of their encoding converters, pictures, and media files are no longer available. This is due to Vista’s virtual store ‘feature’. For encoding converters, it is usually simplest to re-add the missing encoding converters. Technical Details: When a non-administrative Vista user creates a file under Program Files, instead of writing the files under Program Files, the files are created under c:UsersYourLoginNameAppDataLocalVirtualStoreProgram Files where YourLoginName is your Vista login name. If multiple users log on to a machine, there will be multiple copies of these files. FieldWorks 4.9, Speech Analyzer 3.0.1, and SIL Encoding Converters 2.6.1 and later versions no longer write any files under Program Files, so this problem will be avoided. When upgrading from older versions of these programs, user files from Program Files are copied to the new location under c:ProgramDataSIL. However, the installers do not catch files from these virtual directories. If you are missing encoding converters after an upgrade, you should copy the contents from the MappingFiles and Repository folders from your VirtualStoreProgram FilesCommon FilesSIL to similar directories under c:ProgramDataSIL. When you run the installer if you do not have a suitable version of MS Word installed then SIL Converters for Word will be missing from the selection list. This is because SIL Converters for Word cannot be installed without Word already being present. SILConverters 2.6 supports encoding conversions using Python Version 2.4. This means you must have a Python Version 2.4.x. installed on your computer. It will not work with an earlier or later Python version (e.g. 2.3.1 or 2.5.2). 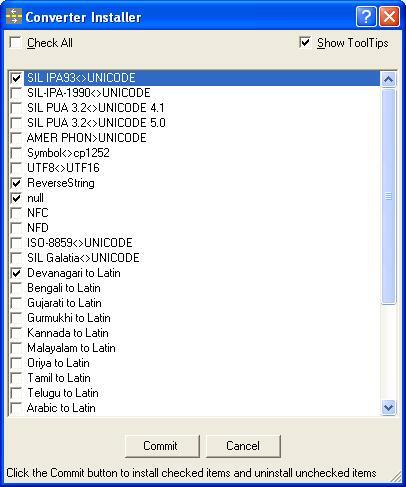 SIL Converters 2.6 supports encoding conversions using only Perl Version 5.8.7. It will not work with any other Python version (e.g. 5.8.8). The Perl converter has been tested with the following freely available Perl distributions: ActiveState Perl or PXPerl.